A bamboo bird cage is a style of cage that is very popular in Asia and so is often called a Chinese bird cage or Japanese bird cage. These bamboo bird cages are usually sold for housing pet birds but they can also be used for decorative purposes as well. The advantage of using wood or bamboo over metal is that is much lighter. This makes it easier to carry and also makes bamboo cages particularly useful when being using as a hanging bird cage. Thai Bamboo Bird Cage – handcrafted and beautifully designed Asian style cage. Barrel Shaped Bird Cage – created using bamboo and ratten wood. Pagoda Style Bamboo Cage – that even comes with it’s own bird cage cover. Chinese Bamboo Cage – which will look good in the corner of any room. 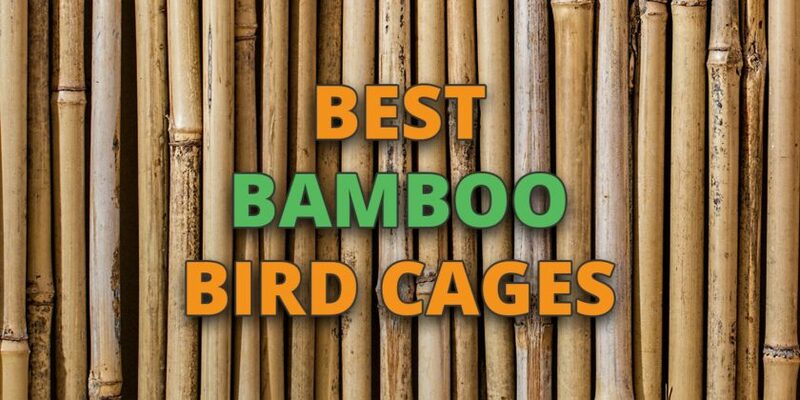 When reviewing these bamboo bird cages we looked at a number of factors: whether they were handmade or factory produced, size, bar spacing, bamboo thickness and internal features included. Because bamboo cages are sometimes handmade and imported from Asia, this tends to make them more expensive in comparison to normal bird cages. It has a beautiful, oriental style design that can be either hung or just rested on a table. It’s handmade. It works as both a decorative item or can be used to house a small live bird. The cage comes with a perch, access door, 2 small watering/feeding porcelain cups, hooks for accessories and has a section beneath the cage where a tray can be placed to collect waste. A superbly elegant bird cage which is made from both bamboo and rattan wood. Handmade with top quality craftsmanship. Comes with an elegant red cloth cage cover and hook. Can either be hung from the ceiling or placed on the table. Internal features include 2 perches, 1 feeding/watering cup, internal stand. It’s fairly affordable compared to bamboo cages used to actually house birds. It even comes provided with it’s own bird cage cover. It will look great hanging in a room as the cage looks very authentic and has all of the features you would expect of a bird cage: access door, perch, feeding/watering cups. It’s small and lightweight so it can easily be hung in the corner of a room. It has the shape of a pagoda roof, also with a barrel shaped design and 3 foot base. It comes with a perch and decorative cup. Because bamboo is a fairly difficult material to construct with, a lot of cages are handmade. This means the craftsmanship is to a higher standard. Whilst there are factory made options as well, they tend to not have the same elegance and quality level as handmade bird cages. Bamboo cages are normally fairly small in comparison to standard bird cages. If using a decorative item then this doesn’t matter but for pet bird owner’s you’re going to have to think about the minimum size you need the cage to be. For small birds such as finches, at a minimum you want the cage to have a space that is 20″ by 24″ by 24″. Because bamboo is so light, it’s a type of material that works particularly well with hanging bird cage stands and hooks. Typically, a bamboo bird cage will weigh 5 to 10 lbs. Most bamboo cages come with a bar spacing that is very small as they are designed for smaller birds. When looking after smaller sized birds, at a maximum you don’t want bar spacing to be bigger than 1/2″. The wooden bars that are used on a bamboo cage don’t need to be particularly thick but you want their diameter to be 2mm at a minimum. When looking after birds, you’ll want every bird cage to have a perch, feeding/watering stations, access door and ideally space for a toy. Cleaning a bird cage can be made much easier if a removable floor tray is included in the design of the cage. Typically, you won’t find many bamboo bird cages for sale secondhand. However, if you do then you need to double check the type of polish or varnish that is used. You’ll need to give it a good clean down after purchase and you’ll want to ask the owner what happened to the previous pet bird and why they’re selling the current cage. If you’re interested in breeding your smaller sized birds then you’ll want to provide them with an area to lay their eggs. Kaytee provides nest options for both Finches and Canaries. Most bamboo cage are designed to be hung either from the ceiling or by using a bird cage stand. 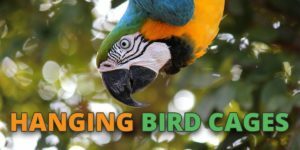 We have an entire guide showing you the best bird cage stands to buy which you can check out here. Hanging bird cages usually need a bird cage cover to go with them at night time so the birds do not feel vulnerable. 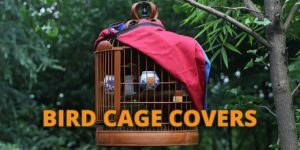 You can check out the best bird cage cover on the site here.